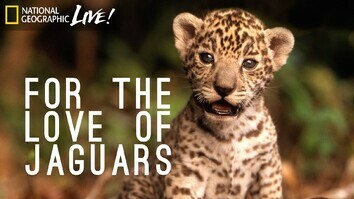 Jaguars vs. Giant Otters: Who Will Win? April 26, 2018 - This is a giant otter. These are two jaguar sisters named Medrosa and Jaju. They are engaged in a standoff near Panthera’s research station in Southern Brazil. Jaguars have a diet of primarily caimans and capybaras … but these sisters seem intent on possibly broadening their dietary horizons. 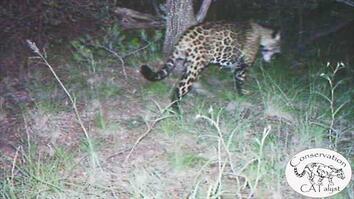 This individual was able to scare off the two jaguar sisters. Giant otters are carnivorous and have acute agility in the water. Some local tribes have dubbed them “aquatic jaguars." The otters form social groups to help maintain control of their territories and to protect one another. In this second standoff between a young female jaguar and a family of otters, the otters prevailed again. 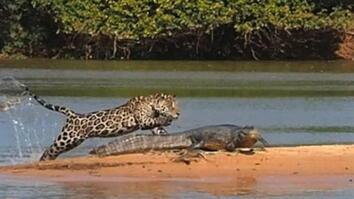 Read "Two Hungry Jaguars Are No Match for This Plucky Otter." This is a giant otter. These are two jaguar sisters named Medrosa and Jaju. They are engaged in a standoff near Panthera’s research station in Southern Brazil. but these sisters seem intent on possibly broadening their dietary horizons. This individual was able to scare off the two jaguar sisters. Giant otters are carnivorous and have acute agility in the water. Some local tribes have dubbed them “aquatic jaguars." The otters form social groups to help maintain control of their territories and to protect one another. In this second standoff between a young female jaguar and a family of otters, the otters prevailed again.